Kitchen is not a room that you re-decorate often and it’s usually more about functionality than style. Still, it’s good to keep an eye on the latest trends and should you decide to change an accent or two in your kitchen or even remodel it, you’ll have something to choose from. So here are the top 10 latest kitchen decor trends that we already see and expect to continue this year. 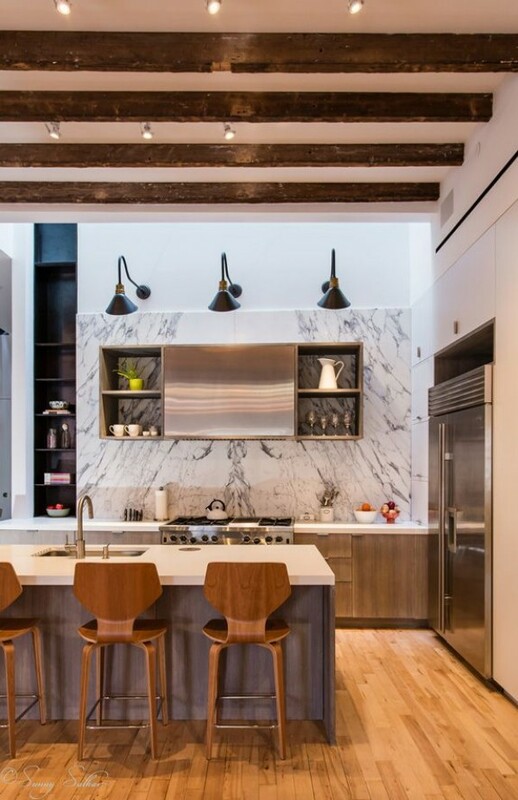 Instead of a sleek modern look with a choice of one or two materials we expect to see more mixed materials that make the kitchen more visually interesting and more alike to other rooms in a home. Gray is becoming the new white as we see a lot of kitchen designs going for the warm and neutral grays with the cabinets, walls and even the floor. From shiny stainless steel that has been popular during the previous years we turn to black finish, and even matte black appliances and cabinets. Contrasting colors have been popular for years and they still find their place this year. That’s especially true with the aforementioned warm grays and matte black. Apron front kitchen sinks have been gaining in popularity last year and they are here to stay, except that we can see them in accent colors now. To complement the black stainless steel appliances and matte black cabinets gilded or brass fixtures and hardware finishes are here to stay. Hiding all the cords of electronics has been a popular DIY project and it continues to be a trend in kitchen design. We expect more kitchens to implement drawers with integrated power outlets like these. Faux granite or marble countertops are becoming more convincing and it’s a great way to save on the real deal. We expect to see more and more of these black matte or metallic modern architectural design faucets. Neutral hues have a very convenient feature – they provide the flexibility to choose accents on a whim. Keeping the walls and cabinets neutral but choosing accents in hardware finishes, fixtures, or even the sink is the popular way to design a kitchen this year.